We were given a project that instructed us to create an infographic on a key theme from Their Eyes Were Watching God. 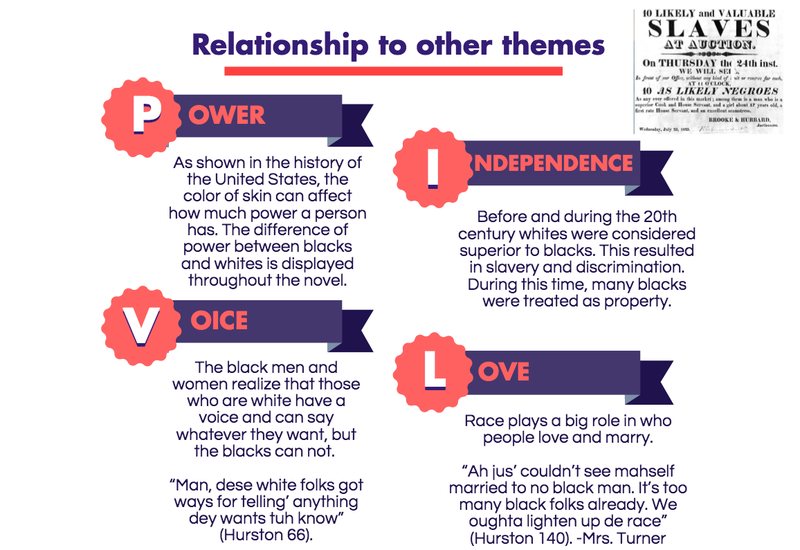 My infographic focuses on the theme of race in the novel. It discusses the characters’ connections to race, the relationship between race with other themes in the book, and the presence of race throughout the chapters. I enjoyed creating this infographic because I got to look at the importance of a modern day issue in the 1920s/1930s time setting of the novel. The elements of the infographic are below or you can access the full infographic by clicking here. Haley Dion is a IV Form boarding student from Medway, MA. She runs cross country, rows crew, and enjoys spending time with her friends and family.